where I is the current across the plate length, B is the magnetic flux density, d is the depth of the plate, e is the electron charge, and n is the charge carrier density. In general, the Hall voltage is not a linear function of magnetic field though it can be easily calculated by assuming that all carriers have the same drift velocity. All carriers present are of only one type. carriers of both types are present. This simple expression for R allows both the band gap energy and the donor level energy to be determined by studying the change in R with temperature. RH(T) depends only on n(T), the charge carrier density. 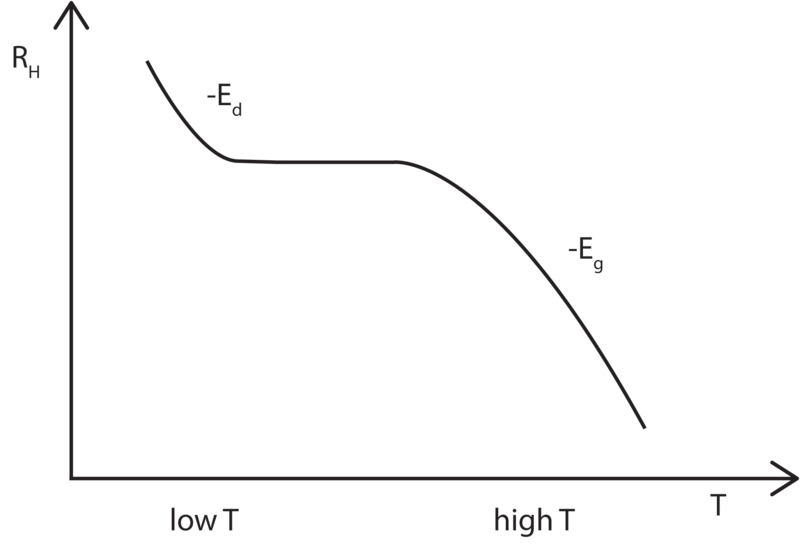 At low temperatures, there is only enough thermal energy to excite carriers from the donor levels (Ed) close to the conduction band edge up into the conduction band. Therefore it is expected that RH will decrease linearly with a slope proportional to -Ed, before plateauing out once all the donors have been ionised. At higher temperatures, carriers can now be excited across the band gap and thus the Hall coefficient will again begin to decrease, this time with a slope proportional to Eg. where μh and μe are the hole and electron mobilities and p, n are the respective carrier densities. Here it is common to assume the conventional geometry, in which the current flows along x, the magnetic field is applied along z and the Hall field appears along y. The boundary conditions in this geometry require , but this does not mean that the hole and electron currents in this direction are individually zero, merely that they are equal and opposite. where we have used the steady state solutions to obtain the last line. This is more complex then the previous expression for RH. The band gap energy may still be obtained but a different method has to be employed. This method is described in more detail in the Temperature Dependence sub-page. In general μh < μe so if p>n then R may become negative. This is known as inversion and is obviously a characteristic of only p-type semiconductors.